Welcome to the Swing Fever Dance Band! Swing Fever Dance Band is a non-profit corporation whose purpose is to perform and encourage the enjoyment of big band music. Swinging since 1983, this 19-piece big band, complete with vocalists and an emcee, has been recreating the big band sound of the 1930’s and 1940’s and performing music selections that span over five decades. 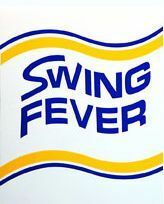 Swing Fever Dance Band offers quality music with an authentic big band sound.